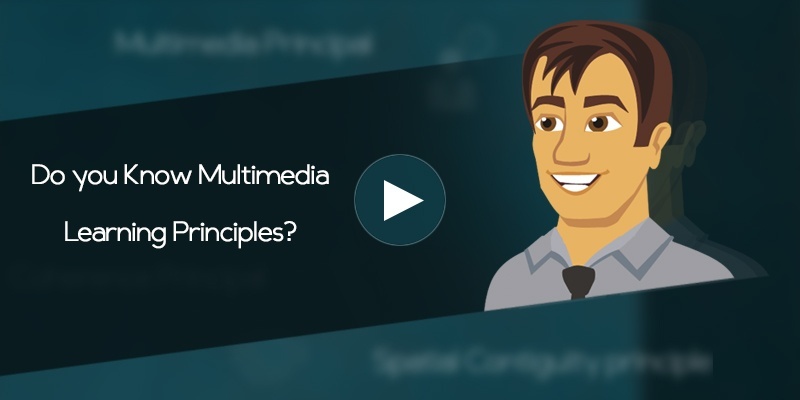 Do you Know Multimedia Learning Principles? Multimedia learning principles help course designers to effectively design the courses without making them dull and stressful. Following these principles while designing, makes the course lively and also paves way for deeper learning making real impact. This week’s E-learning Challenge being building an interaction to teach one or few principles of Multimedia Learning, we build a story of a person called Mike, who created his first e-learning course on “Things to remember for a successful employee lifecycle” and put him to worry. Focusing the goal of the course, we designed it with a view to engage learners and make them design the screens in a right manner so that they would really involve and learn. We used articulate storyline to build this short interaction offering learners knowledge of three Multimedia Learning Principles and some quick useful tips when attending interview, on being a new hire and managing stress at work.